Will the stock Clinton scandal response be enough to weather this storm? 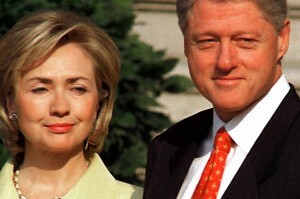 Say this about Bill and Hillary Clinton: They are predictable. Some politicians dare to change, even to evolve, but not the former first couple. In these uncertain political times, Team Clinton’s lack of ethics—and its stock response when caught—is our one constant. The details change, of course. In 1978 it was lucrative cattle futures; in 2014 it was lucrative speeches. In the 1990s it was missing Whitewater and Rose Law firm records; today it is missing emails. In 2000 it was cash for pardons; now it’s cash for Russian uranium mines. In Little Rock, it was Bill’s presidential campaign vehicle; in New York, it’s Hillary’s—and now known as the Clinton Foundation. Details. Chapter One: “Pick Your Spots.” The Clintons flourish in that hazy interface between legal and lawless. Chapter Three: “Remember, the Press Has ADD.” Pixar’s “Up” features Dug, a cute dog with a serious attention problem (“squirrel!!!”). This is how the Clintons view the media. Pettable. Unfocused. Chapter Four: “Vast Right-Wing Conspiracy”—or VRWC. Mrs. Clinton’s conspiracy shtick is today a bit of a joke, but it doesn’t make it any less effective. The rest of the book falls under the heading “Stockholm Syndrome,” and consists of tactics for convincing fellow Democrats that the Clinton machine is inevitable. The Democratic Party has for so long been held psychologically hostage to the Clinton scandal factory, a part of it—albeit an aging part—has forgotten there is happy, normal life. So (for now at least) it sticks with its captors. The Democratic Party has changed. It’s now more Obama than Clinton, its left dominated by progressives who didn’t grow up under Hillary, and don’t much like her. They want Elizabeth Warren, and what surely terrifies the Clintons is the potential party explosion were the Massachusetts senator to jump in at this moment of vulnerability. Would it take much to send the party bolting to a fresher female firebrand—without the baggage? Maybe not, because Mrs. Clinton isn’t putting on the best show. She never had Bill’s political charm, and her years out of elected politics are showing. She looks grim. She looks cautious—hedging her bets, refusing to take positions. She looks out of touch, in the Scooby-Doo van. Mrs. Warren doesn’t have any of these problems.